The wreckage of Cessna 172 was yesterday removed from the crash site at the Delaikoro Ridge, in Macuata, under the supervision of Air Accident Investigator Andrew McGregor. 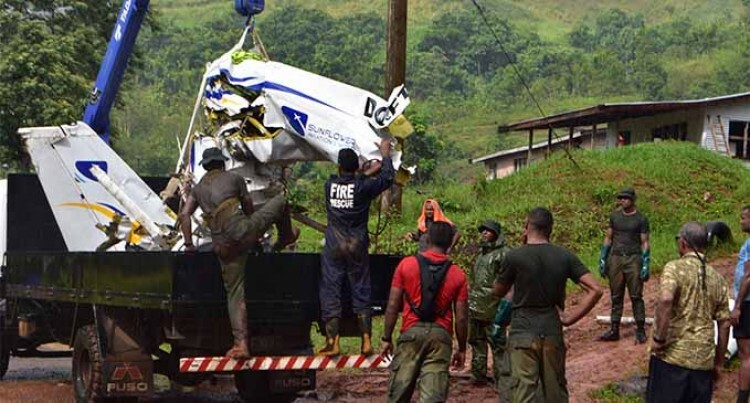 With the help of a helicopter sent in by the Pacific Flying School, about 15 personnel from Republic of Fiji Military Forces, Fiji Police Force, National Fire Authority and Dogoru villagers worked hand-in-hand to recover the wreckage. It takes 10 to 15 minutes to travel by helicopter from the crash site to Dogoru Village. Those involved in the removal tied the wreckage with thick ropes and cables and pulled parts of the Cessna 172 out. Parts of the wreckage were transported to Dogoru Village tied to the helicopter. At 1pm the wreckage was loaded in a truck and taken to the Sukanaivalu Barracks in Vaturekuka, the army base in the Northern Division. The wreckage had to be transported in two trips from the village to the military camp. Pacific Flying School instructor Iliesa Tawalo and student pilot Merelesita Lutu were on a routine training flight when the Cessna 172 registration DQFTR they were travelling in crashed in the Delaikoro Ridge, in Macuata, on 26 February during bad weather. Mr Tawalo was laid to rest at the Enamanu Cemetery in Nadi yesterday while Ms Lutu will be be buried today at Lovonilase, Suva Cemetery.